Picture this: A proactive community of open-minded producers joining forces for the greater good. With all of them together, they work to increase yields and soil health, and gain a better understanding of their livelihoods. If such a community existed, would you be interested? It may seem “pie in the sky”, but one state down, that’s exactly what’s going on. For the last several years, an 8-member group of Nebraskan producers has gathered in the pursuit of shared knowledge. In that time, the positive effects of the union have been undeniable. Nobody knows this better than group member and Palmyra, Nebraska native Mike McDonald. As McDonald can attest, this is just the tip of the iceberg. What separates this group from your average producer get together is that they don’t stop at surface-level issues. Just like the roots of their crops, they always dig just a little deeper. One of the more popular topics of discussion? Cover crops. More specifically, livestock and how it relates to the practice. It’s pretty obvious that high intensity paddock grazing can be a bit labor intensive, so to include such a practice in one’s operation, you’d have to thoroughly believe in its efficacy. Mike McDonald and members of his group have seen enough of the benefits of the practice to incorporate it despite the concerns. In fact, McDonald believes in it so thoroughly that he loaned 40 head of livestock from a fellow group member for a 20-acre site. So what were these benefits? According to McDonald and his group: increased soil fungi and other microbes (these are the “good guy” microbes that Dr. Elaine Inhgam talks about), decreased herbicide usage, and increased overall pool of organic nutrients (yes, nutrient pools can be organic as well as inorganic). Or look at it this way: increased efficiency and effectiveness leads to increased sustainability. Of course, paddock grazing isn’t the only value-added practice that the 8-member group has tested and employed. McDonald also has up to 41 bee hives on his property that are responsible for increased production. After their discussions and research, the group also endorses cutting out virtually all fertilizer and herbicides as well as focusing on income diversity. Of course, with knowledge comes responsibility and the group acknowledges that. 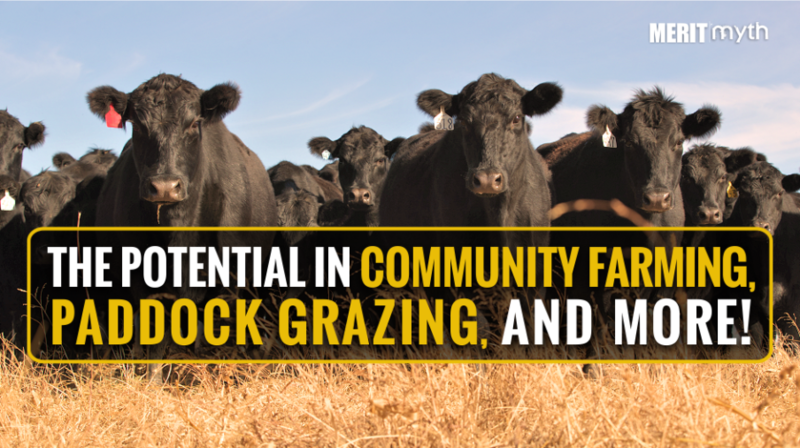 To incorporate livestock into an operation, one must be aware of cover crop maturity dates prior to planting, and proper grazing windows, but the results speak for themselves. The idea of community learning shouldn’t be new to those who’ve followed along with us at Merit or Myth – uniting the South Dakota farming community has been a crucial discussion point for us. We’re excited to see such practices playing out in surrounding areas and confident that similar stories will start popping up across the Mt. Rushmore State soon. In the meantime, keep your ear to the ground and listen for what your soil is telling you. There’s no telling what you’ll hear next!